This book introduces Proto-Indo-European and explores what the language reveals about the people who spoke it. The Proto-Indo-Europeans lived somewhere in Europe or Asia between 5,500 and 8,000 years ago, and no text of their language survives. J. P. Mallory and Douglas Adams show how over the last two centuries scholars have reconstructed it from its descendant languages, the surviving examples of which comprise the world's largest language family. After a concise account of Proto-Indo-European grammar and a consideration of its discovery, they use the reconstructed language and related evidence from archaeology and natural history to examine the lives, thoughts, passions, culture, society, economy, history, and environment of the Proto-Indo-Europeans. Our distant ancestors had used the wheel, were settled arable farmers, kept sheep and cattle, brewed beer, got married, made weapons, and had 27 verbs for the expression of strife. The subjects to which the authors devote chapters include fauna, flora, family and kinship, clothing and textiles, food and drink, space and time, emotions, mythology, religion, and the continuing quest to discover the Proto-Indo-European homeland.Proto-Indo-European-English and English-Proto-Indo-European vocabularies and full indexes conclude the book. Written in a clear, readable style and illustrated with maps, figures, and tables, this book is on a subject of great and enduring fascination. It will appeal to students of languages, classics, and the ancient world, as well as to general readers interested in the history of language and of early human societies. 3. 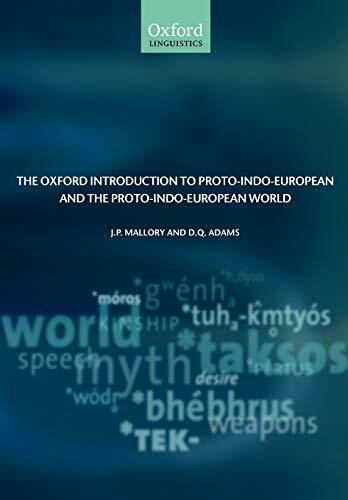 Oxford Introduction To Proto-Indo-European And The . Mallory, J. P.; Adams, D. Q.; Mallory, J P; Mallory, J.p.; Adams, D.q. Mallory, J. P.; Adams, D. Q.